Hiya guys! So... you may notice something a little different about my nails. Yup, not only am I a resident of nub city once again, but I am now on #teamround. Although these were definitely forced one me due to a nasty break, I can't like and say they aren't growing on me. No bad pun intended. Then again it could just be these gorgeous shades making me love them. Today I'm sharing swatches for the Greek Goddess Collection by Smokey Mountain Lacquers, which consists of seven gorgeous summer creams and holos. I'm slapping the official 'photo heavy' warning here and without further ado, let's get to the swatches! 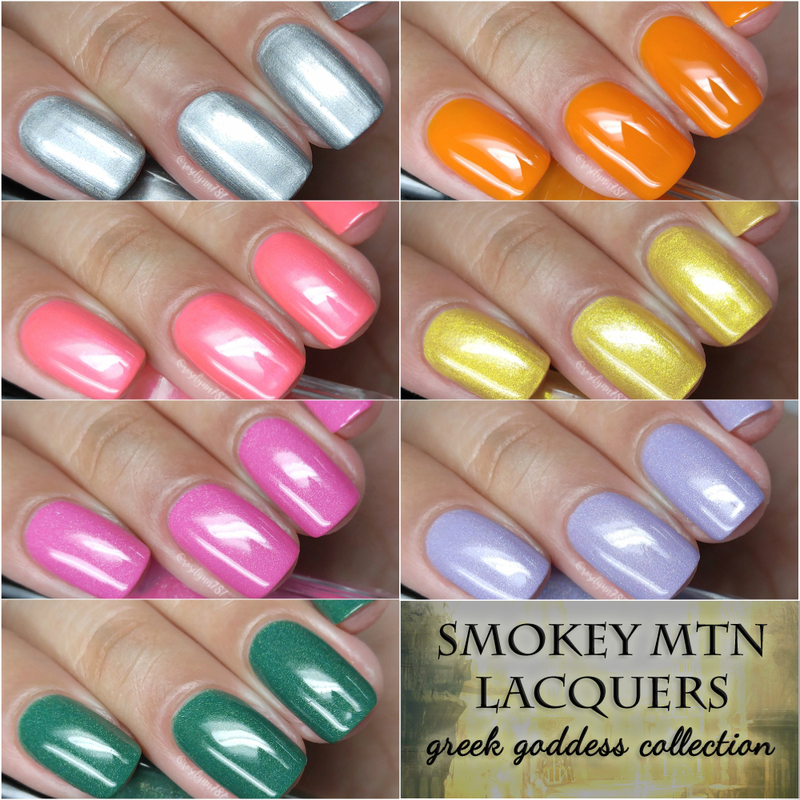 The Greek Goddess Collection by Smokey Mountain Lacquers will be available for purchase Friday, June 2nd at 7PM CST. Each full-size bottle will retail between $8 to $11, depending on the finish. There are also mini-size for retail between $6 to $7. Hera can be described as a a silver cream holo. Starting off this review with one of my favorite from this collection! The formula has a really opaque application, almost a one coater. Very smooth! There are minimal brush strokes in the finish, but mostly blend out after topcoat. Shown in two coats and sealed with a glossy topcoat. Aphrodite can be described as a a coral pink cream with a little bit of a pink flash. The formula has a very sheer application, but it builds-up well on the nail. Shown in three coats and sealed with a glossy topcoat. Hestia can be described as a a lilac cream holo. The formula has a sheer application that builds-up really nicely on the nail. Shown in two to three coats and sealed with a glossy topcoat. Athena can be described as a a neon orange cream. The formula has a sheer application that leans more towards being a jelly than a cream. It has a good build-up and is easy to layer, but still had a visible nail line. Consistency wise it's a bit on the thin side, but does not run and is perfectly manageable. It dries to a super high-shine finish on its own. Shown in three coats and sealed with a glossy topcoat. Nike can be described as a a sparkling gold cream. The formula has a similar opaque application like Hera, but without as much of a metallic feel to the finish. Although it's very opaque, it's not quite enough to be a one coater. There are also very minimal brush strokes in the finish that blend out after topcoat.Shown in two coats and sealed with a glossy topcoat. Persephone can be described as a a magenta cream holo. The formula has a really great smooth application with a nice bit of opacity. Shown in two coats and sealed with a glossy topcoat. Demeter can be described as a a forest green cream holo. And we have to end this review on a strong note with yet another favorite of mine! The formula has a smooth application with a nice level of opacity. 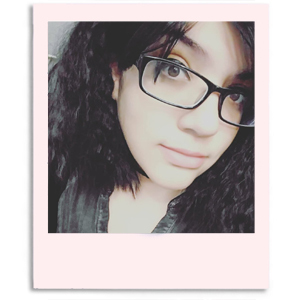 It was on the sheer side, but I also felt like I applied it with a bit of a light hand. Shown in two to three coats and sealed with a glossy topcoat. Along with the release of this collection, you'll also find two new products in the shop: base and topcoat. I've swatched this collection using both of these and so far I'm really liking them. I'll be using these exclusively for the next month and will update you guys with a full review! Overall this collection was just jam-packed with so many shades I was not expecting to fall in love with. It's really hard to narrow them down, but for me the must-haves go to Demeter, Hera, and Nike. They are absolutely stunning and just felt really unique to my collection, especially that green *swoon*. Not only that, but these shades are supposed to really watermarble nicely as well. I'm looking forward to trying that out for myself, so stay tuned for that next week. To recap, the Greek Goddess Collection by Smokey Mountain Lacquers will be available for purchase Friday, June 2nd at 7PM CST. Each full-size bottle will retail between $8 to $11, depending on the finish. There are also mini-size for retail between $6 to $7. Those are all so beautiful! I love sparkles and those shimmers and holos are very pretty.